By definition, web scraping refers to the process of extracting a significant amount of information from a website using scripts or programs. Such scripts or programs allow one to extract data from a website, store it and present it as designed by the creator. The data collected can also be part of a larger project that uses the extracted data as input. Previously, to extract data from a website, you had to manually open the website on a browser and employ the oldie but goldie copy and paste functionality. This method works but its main drawback is that it can get tiring if the number of websites is large or there is immense information. It also cannot be automated. With web scraping, you can not only automate the process but also scale the process to handle as many websites as your computing resources can allow. In this post, we will explore web scraping using the Java language. I also expect that you are familiar with the basics of the Java language and have Java 8 installed on your machine. The time required to extract information from a particular source is significantly reduced as compared to manually copying and pasting the data. The data extracted is more accurate and uniformly formatted ensuring consistency. A web scraper can be integrated into a system and feed data directly into the system enhancing automation. Some websites and organizations provide no APIs that provide the information on their websites. APIs make data extraction easier since they are easy to consume from within other applications. In their absence, we can use web scraping to extract information. Search engines such as Google and DuckDuckGo implement web scraping in order to index websites that ultimately appear in search results. Communication and marketing teams in some companies use scrapers in order to extract information about their organizations on the internet. This helps them identify their reputation online and work on improving it. Web scraping can also be used to enhance the process of identifying and monitoring the latest stories and trends on the internet. Some organizations use web scraping for market research where they extract information about their products and also competitors. These are some of the ways web scraping can be used and how it can affect the operations of an organization. JSoup - this is a simple open-source library that provides very convenient functionality for extracting and manipulating data by using DOM traversal or CSS selectors to find data. It does not support XPath-based parsing and is beginner friendly. More information about XPath parsing can be found here. These are but a few of the libraries that you can use to scrap websites using the Java language. In this post, we will work with JSoup. Having learned of the advantages, use cases, and some of the libraries we can use to achieve web scraping with Java, let us implement a simple scraper using the JSoup library. 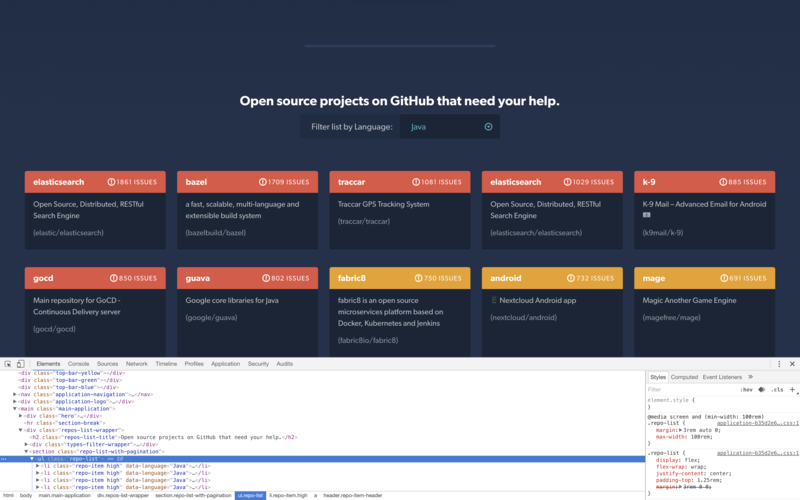 We are going to scrap this simple website I found - CodeTriage that displays open source projects that you can contribute to on Github and can be sorted by languages. Even though there are APIs available that provide this information, I find it a good example to learn or practice web scraping with. We are going to use Maven to manage our project in terms of generation, packaging, dependency management, testing among other operations. OS name: "mac os x", version: "10.14.1", arch: "x86_64", family: "mac"
This will generate the project that will contain our scraper. In the folder generated, there is a file called pom.xml which contains details about our project and also the dependencies. 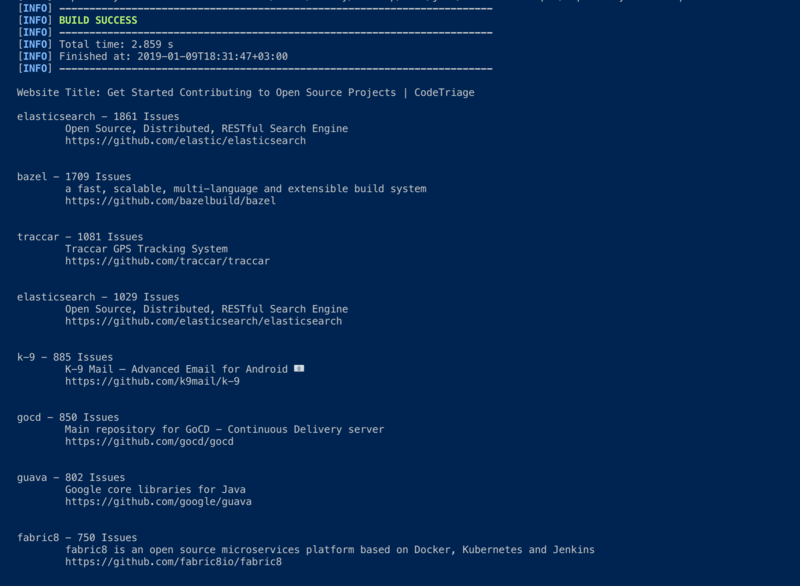 Here is where we'll add the JSoup dependency and a plugin setting to enable Maven to include the project dependencies in the produced jar file. It will also enable us to run the jar file using java -jar command. in the produced jar file. The result should be Hello World! printed on the console. We are ready to start building our scraper. Before we implement our scraper, we need to profile the website we are going to scrap in order to locate the data that we intend to scrap. To achieve this, we need to open the CodeTriage website and select Java Language on a browser and inspect the HTML code using Dev tools. 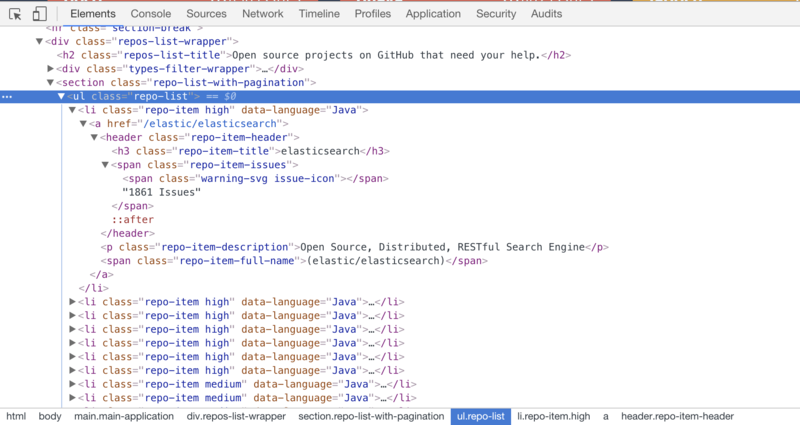 On Chrome, right click on the page and select "Inspect" to open the dev tools. As you can see, we can traverse the HTML and identify where in the DOM that the repo list is located. Each repository is contained in list item entry whose class attribute is repo-item and class includes an anchor tag that houses the information we require. Inside the anchor tag, we have a header section that contains the repository's name and the number of issues. This is followed by a paragraph section that contains the repository's description and full name. This is the information we need. At the top of the file, we import IOException and some JSoup classes that will help us parse data. Our scraper is taking shape and now we can extract more data from the website. We identified that the repositories that we need all have a class name of repo-item, we will use this along with JSoup getElementsByClass() function, to get all the repositories on the page. For each repository element, the name of the repository is contained in a Header element that has the class name repo-item-title, the number of issues is contained in a span whose class is repo-item-issues. The repository's description is contained in a paragraph element whose class is repo-item-description, and the full name that we can use to generate the Github link falls under a span with the class repo-item-full-name. // The reposiory full name contains brackets that we remove first before generating the valid Github link. Yes! Our scraper works going by the screenshot above. We have managed to write a simple program that will extract information from CodeTriage for us and printed it on our terminal. Of course, this is not the final resting place for this information, you can store it in a database and render it on an app or another website or even serve it on an API to be displayed on a Chrome Extension. The opportunities are plenty and it's up to you to decide what you want to do with the data. In this post, we have learned about web scraping using the Java language and built a functional scraper using the simple but powerful JSoup library. So now that we have the scraper and the data, what next? There is more to web scraping than what we have covered. For example: form filling, simulation of user events such as clicking, and there are more libraries out there that can help you achieve this. Practice is as important as it is helpful, so build more scrapers covering new ground of complexity with each new one and even with different libraries to widen your knowledge. You can also integrate scrapers into your existing projects or new ones. The source code for the scraper is available on Github for reference.